Bugatti Galibier 16C Concept Makes Public Debut in Los Angeles - Best Sedan Ever? Bugatti Galibier 16C Concept Makes Public Debut in Los Angeles – Best Sedan Ever? So, what’s our take? 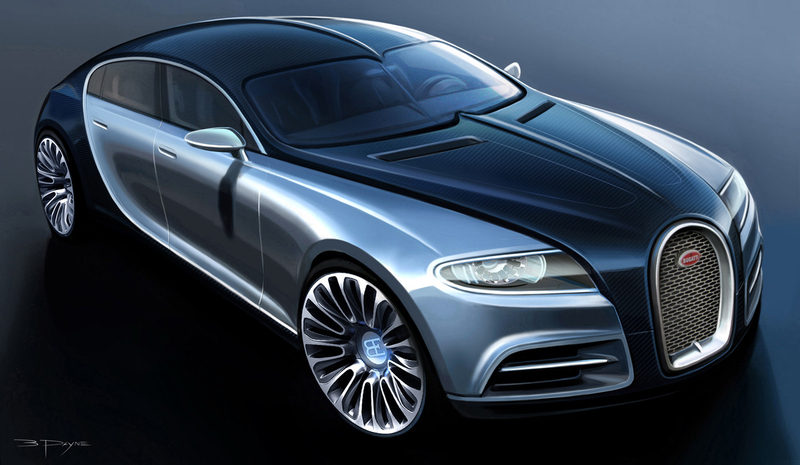 The body of the Bugatti Galibier looks like a stone polished by hundreds of years in a stream. 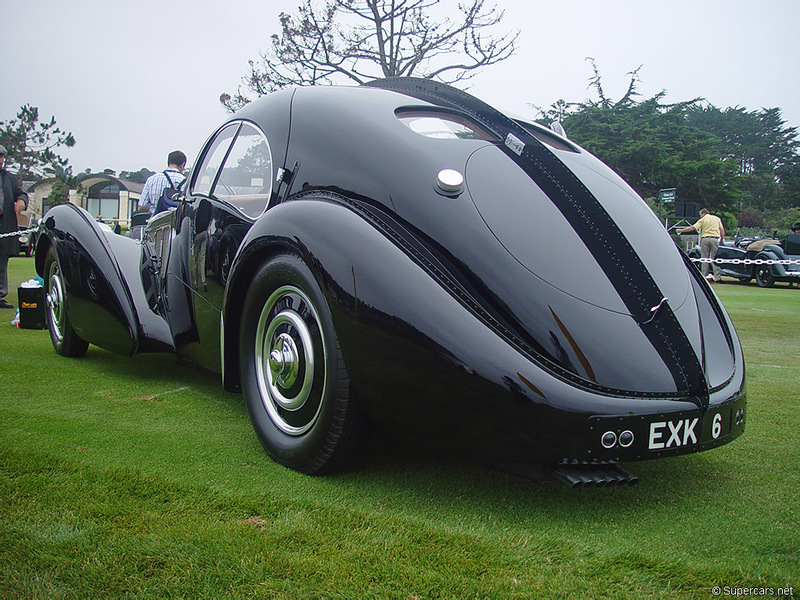 The long hood reminds us of the incredible cars of the 20’s, 30’s and 40’s. Back then, the hood made room for big engines, but it became a symbol of luxury, like a procession arriving ahead of a king. The profile rises early then slowly wraps around into the tail like a coupe. Even the hydraulic wing seems soft. The split rear window is a rare but wonderfully timeless cue. People are saying it looks like a Panamera. No. 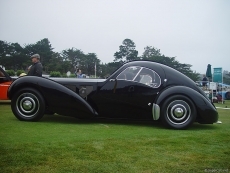 It’s not copying a car that came out in 2009, it’s paying homage to a car from 1937, the Bugatti Type 57SC Atlantic (above), one of the most beautiful coupes ever. I saw one at Pebble Beach, owned by Ralph Lauren, and I agree. A performer and a beauty, it was made from aluminum and supercharged. It had 200hp and went 123mph. This one has carbon fiber, 800hp and goes 220 mph. The 16C is a 57 for the 21st century;lightweight material, forced induction, beauty and speed. They share soft curves, a flowing design, even the unnecessary exhaust tips. Look at the tail of each for proof. Inside is even better. “Inviting” doesn’t even begin to describe it. The wood, leather and metals are all perfectly chosen. The magic is its simplicity. No buttons, knobs, slides, wheels. There is absolutely no clutter. All that is replaced by an iPod-like menu in the dash. Even the vents, long slices accented with aluminum, are brilliant. The center console flows back from the centered gauges. This isn’t a car where you need everything at your fingertips at once. In this car, worries and stress cease to exist. We are very much looking forward to the production release in 2012. Especially since it will share the superb 8.0-liter W-16 setup from the Veyron, but with twin supercharges in place of the quad-turbos. In addition, a new 8-speed transmission is rumored to be replacing the 7-speed DSG. Perfect? No. The front looks more like a lowered Q7 than a 57. The Bugatti Galibier 16C also can’t fly or stop time, and it costs $1.6 million dollars. But this does to ultra-luxury sedans what the Veyron did to super cars. It puts “the bar” on a rocket and plants it on the moon. this beautiful I hope they build this. Maybe one day I will be able to afford it. 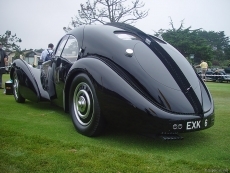 the most amazing car even been made is the bugatti, and now with carbon fiber it will be the greatest in history. good job to the people create carbon fiber as well the designers behind bugatti!! !